REAL Fat Loss & Reduction In Appearance Of Cellulite: Unlike other body wrap systems that help you lose water weight, Formostar helps you tone your muscles, define your body and keep weight off permanently. Approximately 900 to 1400 calories are burned in each treatment session, so you will see results accumulate fast. Most people lose about one size every six to ten sessions. We can also target cellulite, to smooth skin and get rid of unsightly ripples and bumps. Lose inches, and reduce fat without surgery or diets. The most deeply penetrating of all heat-treatment systems, our Formostar Infrared body wraps can eliminate deep toxins. Infrared heat is a proven method for activating your body's natural enzymes and metabolic cellular activity. Combined with proper hydration, you will feel the difference in days! 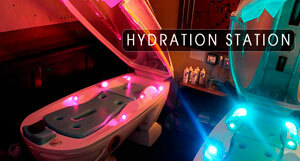 Our top-of-the-line Formostar equipment and spa-like environment ensures a warm, soothing and restful session. You also benefit from the infrared body wrap's ability to rejuvenate your skin, resulting in softer, smoother skin and firmer body tone. You'll notice a difference - stretch marks and cellulite are visibly reduced.